Is Prescribing A Trial And Error Process? I found this chart fascinating. As we know, drugs don’t always work (and not just because people don’t actually take them). BUT did you realize in some cases it’s a coin flip of whether a drug will work for you? 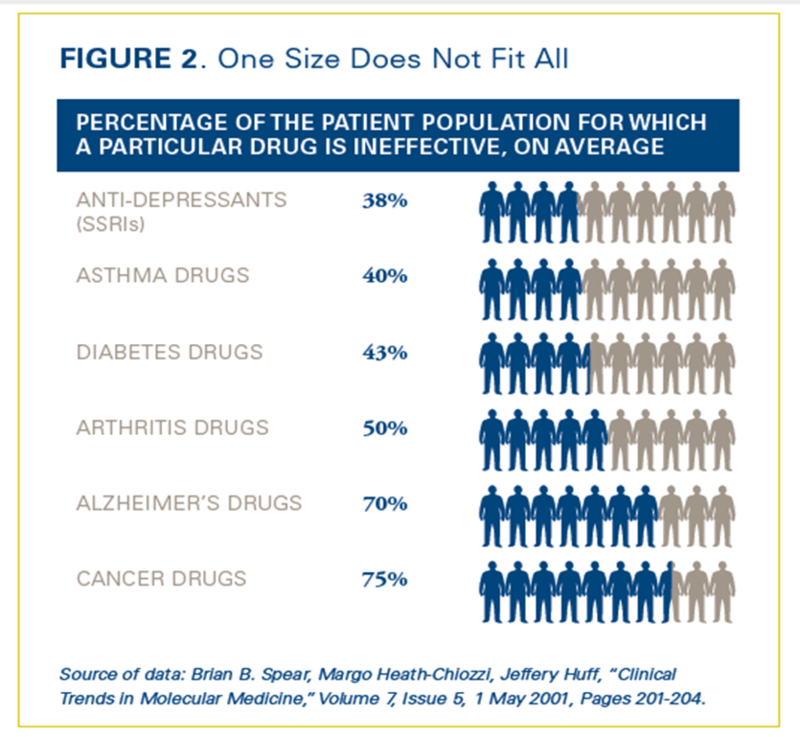 Data like this is just more support for the case for personalized medicine. If a genetic test can help determine which drug will work in a patient, you can address their disease faster, avoid unnecessary side effects, and impact overall healthcare consumption and costs. The key of course is finding tests that can be administered easily and at a low cost for which the economic benefits exceed the costs. Of course, addressing the education gap within the physician community and patient community to separate facts from myths is important. For the 17th year, Towers Watson and the National Business Group on Health published their survey of employers. There’s some fascinating data in there. I grabbed two charts to share here. As you can see, wellness, transparency, and incentives are all popular topics. Engagement of consumers is also another hot topic. Epigenetics is a fairly new area of study that most people haven’t heard much about. We all hear much more these days about personalized medicine attributed in many discussions to the opportunities created by genomics. Also common is airbrushing with a tool such as Luminess Air. But, epigenetics is looking at how genes express themselves and how environmental factors can impact that both in an individual but also in their offspring. From an article in the WSJ, they focused on several areas in terms of our experiences as a kid beginning in the fetus and how that affects our genes. Smoking appears to increase the risk of cancer by deactivating a specific tumor-suppression gene. Stress during pregnancy, such as depression or marital conflict, appears to increase the level of methylation in kids which suppresses the action of a gene. Abuse as a child also appears to explain some epigenetic variation. This is a pretty fascinating area. The one study I’ve often seen referred to is one on twins which shows how their genes change over time. (See PBS video here.) Imagine the ability to influence future generations by your behaviors. Will that change what you do next? In the book called Healthcare in 2020 by Steve Jacob, there is a chapter on End-of-Life Care. It provides some great data all sourced there (so not repeated here). I find this whole are of discussion especially around palliative care very interesting. The challenge of course is that most people don’t want to talk about dying, and physicians are taught to try everything to cure someone. After talking with a few people working in this area, the general scenario is where clinicians and other social workers are helping to enable to a patient to talk to their family and care team about their wishes. It’s not to make the decisions, but to give patients the tools to have an informed discussion. The American Society of Clinical Oncology has established a goal of integrating palliative care into its model of comprehensive cancer care by 2020. A 2009 study of cancer patients found that palliative care improved patient satisfaction and eased pain, fatigue, nausea, insomnia, anxiety, and depression. And, increased appetite. According to the Worldwide Palliative Care Alliance, more than 100M people worldwide would benefit annually from either palliative care or hospice…yet only 8% have access to it. The average physician’s estimate of how long a patient will live was 530% too high. Fewer than 40% of oncologists speak candidly with patients about end-of-life treatments. Physicians equate suggesting hospice as “giving up”. A 2008 published study showed that patient satisfaction was higher, more advance directives were completed, fewer ICU admissions were necessary, and medical costs were lower for patients in palliative care. A hospitalized palliative-care patient costs $279-$374 less per day. In a Medicare study, patients who received palliative care cost $6,900 less during a hospital stay. This seems like great data. Imagine that you can improve a patient’s experience in the last months of life and lower costs. To me, that’s a lot of what our healthcare system needs these days. Here’s another good infographic with some information about readmissions at the top. Motivational interviewing (MI) is a technique that we’ve been talking about in pharmacy for years (e.g., study re: MI and adherence), and care management has also been using this approach (e.g., CV study and chronic kidney study). As we all know, getting consumers to engage is difficult. It’s even more difficult to get them to engage and actually change behavior. Motivational interviewing (MI) refers to a counseling approach in part developed by clinical psychologists Professor William R Miller, Ph.D. and Professor Stephen Rollnick, Ph.D. The concept of motivational interviewing evolved from experience in the treatment of problem drinkers, and was first described by Miller (1983) in an article published in Behavioural Psychotherapy. These fundamental concepts and approaches were later elaborated by Miller and Rollnick (1991) in a more detailed description of clinical procedures. Motivational interviewing is a semi-directive, client-centered counseling style for eliciting behavior change by helping clients to explore and resolve ambivalence. Compared with non-directive counseling, it is more focused and goal-directed. Motivational Interviewing is a method that works on facilitating and engaging intrinsic motivation within the client in order to change behavior. The examination and resolution of ambivalence is a central purpose, and the counselor is intentionally directive in pursuing this goal. Motivational interviewing recognizes and accepts the fact that clients who need to make changes in their lives approach counseling at different levels of readiness to change their behavior. If the counseling is mandated, they may never have thought of changing the behavior in question. Some may have thought about it but not taken steps to change it. Others, especially those voluntarily seeking counseling, may be actively trying to change their behavior and may have been doing so unsuccessfully for years. In order for a therapist to be successful at motivational interviewing, four basic skills should first be established. These skills include: the ability to ask open ended questions, the ability to provide affirmations, the capacity for reflective listening, and the ability to periodically provide summary statements to the client. If you’re going to care for a patient, it’s critical to understand their level of health literacy. A new study shows the correlation (not necessarily cause and effect) between health literacy and death. Older people were twice as likely to die if they had poor health literacy in a five-year period. recently came out. USA Today had an article about this in January (1/24/12). As an introvert, I find this very interesting and could associate with a lot of the points in the article. In humans, shyness (also called diffidence) is a social psychology term used to describe the feeling of apprehension, lack of comfort, or awkwardness experienced when a person is in proximity to, approaching, or being approached by other people, especially in new situations or with unfamiliar people. Shyness may come from genetic traits, the environment in which a person is raised and personal experiences. There are many degrees of shyness. Stronger forms are usually referred to as social anxiety or social phobia. Shyness may merely be a personality trait or can occur at certain stages of development in children. Shyness has also a strong cultural dimension. Will More Rxs Move to OTC or BTC? Next week, the FDA has called a meeting to discuss moving more drugs to over-the-counter (OTC) or behind-the-counter (BTC) status. This means that you would no longer need a prescription. No more need to meet with your physician to get a prescription (new, refill, or renewal). Will this drive more use of “Dr. Google”? Will this create an opportunity for more use of home monitoring and home tests? Will this drive screenings at clinics? Many pharmacy plans don’t cover products that don’t require a prescription so this may change coverage rules. At some point, we’ll just end up with a pharmacy benefit that focuses on specialty drugs. Everything else will be generic, OTC, or BTC. Many of you know that this is one of my favorite topics…the health impacts of sleep. Pharmacogenomics is the study of how genes affect a person’s response to drugs. It has taken a while for people to really understand how and why different people respond differently to the same medications, but I think it’s now commonly understood that people may react very differently to the same medication. In cases where this is dangerous or has serious side effects or is very expensive, the system is looking for new ways of intervening to leverage genetic testing and screening to determine when medications are appropriate. But, the tests aren’t cheap and both patients and physicians don’t always understand when to use them. For example, Oncotype-DX is a genetic test for breast cancer that predicts the risk of recurrence. As a recent article in Employee Benefit News (Feb 2012) said, if you knew that you had a 3% chance of the cancer returning in the next decade, would you still choose to have chemotherapy? The article has quotes from various people debating the use of testing and whether the ROI is there yet. But, I think there are more and more specialty drugs being approved with genetic tests, and it creates unique opportunities. For example, in Hepatitis C, if you knew the variation of the gene that the patient had, you could determine if they needed 24 weeks of therapy versus 48 weeks of therapy. While oncology is a big focus area here, there are other areas such as Hep C, HIV, cardiovascular disease, RA, and high cholesterol where tests are either developed or being developed. I was reading an article from PharmaVOICE (February 2012) on Dr. Deborah Dunshire who is the president and CEO of Millennium, the Takeda Oncology Company and thought I would pull a few things in here since I think the topic of “curing cancer” is very interesting. With early screening, more people living with cancer, and more open discussing of our healthcare, most people can now say they know one (or many) people with cancer so it’s an area that most of us can get very passionate about. Additionally, there is constantly new research around genetics in this area. And, from more of a cost perspective, it’s a huge driver of healthcare costs. She goes on to describe their culture as one of intensity and caring (which sounds like the perfect healthcare environment). Compared to many of the stories you read today about traditional pharma having pipeline challenges and laying people off, this is a motivating interview about the opportunities to improve care for patients through personalized medicine and how bright the future is. Can You Be Allergic to Cold? Apparently, the answer to this question is YES. It’s called “cold urticaria“. It’s a fairly new diagnosis, and researchers are not sure how many people have it. If you have it, you’ll break out in hives after being exposed to cold air or water or even walking into an air-conditioned room. Sometimes, your hands will swell after holding a cold beverage or your lips will swell after eating cold foods. Although not perfect, there is a test for this which is to hold a melting ice cube on the skin, remove it, and wait for a few minutes to see if hives begin. People who eat > 2,143 calories a day are 2x as likely to have mild cognitive impairment as those that eat less than 1,526 a day. People age 45-80 who don’t sleep well were more likely to have amyloid proteins which is the hallmark of Alzheimer’s. Both physical exercise and cognitive exercise have been shown to prevent dementia. Today, 5.4 million Americans are living with Alzheimer’s disease – 5.2 million aged 65 and over; 200,000 with younger-onset Alzheimer’s. By 2050, as many as 16 million Americans will have the disease. Two-thirds of those with the disease – 3.4 million – are women. Of Americans aged 65 and over, 1 in 8 has Alzheimer’s, and nearly half of people aged 85 and older have the disease. Another American develops Alzheimer’s disease every 69 seconds. In 2050, an American will develop the disease every 33 seconds. Most people survive an average of four to eight years after an Alzheimer’s diagnosis, but some live as long as 20 years with the disease. On average, 40 percent of a person’s years with Alzheimer’s are spent in the most severe stage of the disease – longer than any other stage. Additionally, The Alzheimer’s Challenge 2012 was recently announced. The Alzheimer’s Challenge 2012 seeks the development of simple, cost-effective, consistent tools that could be easily used to assess memory, mood, thinking and activity level over time to help improve diagnosis and monitoring of people with Alzheimer’s disease. Today, easy to use, reliable, objective and cost-efficient methods to track and monitor Alzheimer’s disease — which is not a normal part of aging — remain an unmet need. The Alzheimer’s Challenge 2012 supports the U.S. Department of Health and Human Services (HHS) call to harness new thinking to deliver better care and better health at lower cost and provides an entrepreneurial springboard to harness new thinking and approaches to improve Alzheimer’s care. Dr. Agus is a prominent cancer researcher who’s views on cancer are apparently radical (although seem logical to me). In an article about him in Fortune (2/27/12), it talks about how use of statins lowered cancer rates by 40% (although why isn’t known). It also talks about how inflammation is linked to diseases like heart attacks, Alzheimer’s, and diabetes and how taking a baby aspirin might curb inflammation. He’s gone on to be part of the founding team at Navigenics and then subsequently Applied Proteomics. Navigenics, Inc. develops and commercializes genetics-based products and services to improve individual health and wellness. Navigenics educates and empowers individuals and their physicians by providing clinically actionable, personalized genetic insights about disease risk and medication response to catalyze behavior change and inform clinical decision-making. The company was founded by leading scientists and clinicians, and continues to advance genomic knowledge and adoption of molecular medicine through studies with leading academic centers. Navigenics’ services are available through employer wellness programs and health plans, as well as through physicians and medical centers. Proteomics, the study of proteins expressed by the body, has the greatest potential for biomarker discovery. Protein expression profiles, determined from easy-to-collect body fluids (e.g., blood, urine, saliva, etc. ), represent a snapshot of the current health status of an individual, a sum of the influence of genetics and environment. However, assaying such markers is not without its challenges, and proteomics has failed in the past due to immature technologies and a lack of process control. Lack of control adds noise and variability that block effective biomarker discovery and validation. Applied Proteomics, Inc. was founded in May 2007 by Dr. Danny Hills (Applied Minds, Inc.) and Dr. David Agus (USC-Keck School of Medicine) to make proteomics-based biomarker discovery practical and productive. Using their combined expertise in oncology, proteomics, systems control, and computation, the company has developed the leading protein biomarker discovery platform. API’s systems control and computational expertise as well as recent technological innovations (e.g., improved instrumentation, faster computing, and extensive genome annotations) make proteomics-based biomarker discovery possible as a replicable, industrial application. API has demonstrated that its approach leads to superior data (better signal, less noise), which leads to better results (more protein features and biomarkers observed). Better results will lead to improved diagnostics and a more efficient and effective healthcare system. The article talks about several negative reactions to his philosophies, but I must agree that a simple approach to prevention seems much easier to live with then complicated treatment plans on the backend. If you look at the infographic below, it paints a sad picture of how work impacts our healthcare. At the same time, we have lots of discussion about the benefits (or lack of) for disease management and wellness programs. I think its critical for employers to play a role in helping engage and educate their employees about health and wellness. I think this interview with MemorialCare Health System paints a good picture of why and how to approach this. A University of Michigan study revealed health costs for a high-risk worker is three times that of a low-risk employee. American Institute of Preventive Medicine reports 87.5 percent of health claim costs are due to lifestyle. Companies implementing wellness activities save from $3.48 to $5.42 for every dollar spent and reduce absences 30 percent. Last week, I gave a presentation at the PBMI conference in Phoenix. My presentation was on Organic and M&A Growth within the industry. Of course, Express Scripts’ proposed acquisition of Medco and their dispute with Walgreens were front and center since no discussion could be had without discussing these two topics. But, the industry is about more than that. I began my talk by addressing some of the topics that PBMs are discussing today from specialty to copay cards to integration of medical and pharmacy data. I leveraged my interview with Mark Merritt about the adaptability of the industry as key to the industries growth. I went on to talk about how the shifts in the industry were creating more opportunities for other players from OptumRx to CatalystRx and even causing some of the captive PBMs to look more aggressively at business in other areas. And while everyone waits to see what happens with Walgreens, the reality is that Medicare Part D has shown that limited networks can work and that consumers will respond positively to them. Additionally, as many have predicted, consolidation will continue in the industry given the challenges that some of the fundamental traditional metrics are under. Mail order utilization has dropped for the first year ever. More than 50% of all 90-day prescriptions are now filled at retail. Generics continue to grow which is decreasing rebates and allowing for more cash business. The shining star of the industry is specialty. The three big areas of opportunity are around consumer engagement leveraging data and new technologies (i.e., mobile), adherence (especially relative to Medicare Star Ratings), and new growth in the areas of Medicare and Medicaid.